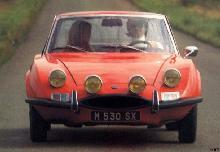 In 1965 Matra's CEO Jean-Luc Lagardère decided to develop a sports car more accessible to the ordinary, non-racing public, a voiture des copains (car for friends), as successor to the Matra Djet. 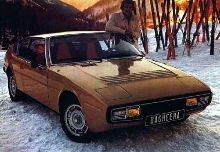 The result was their first sports car (the Djet was a René Bonnet design) M530, named after Matra's R530 missile, designed by former Simca designer Philippe Guédon. Like its predecessor, the car was built upon a steel frame with polyester body and had a mid-engine. To accommodate for both 2+2, mid-engine layout and a reasonable boot, many engine options were considered. Finally, it was decided to purchase the running gear from Ford in Germany: the 1700 cc Ford Taunus V4 engine and gearbox stemming from the Taunus 15M TS were chosen. This setup is compact enough to fit between the rear seats and the boot. The other interesting features of the M530 were its targa top roof, pop-up headlights and most notably the outstanding avant-garde design. M530A painted by Sonia DelaunayThe first 530 (badged Matra Sports M530A) was shown to the public on March 7, 1967 at the Geneva Motor Show. It had a 70 DIN hp Ford 1700 cc V4 engine, which gave the car a top speed of 175 km/h (109 mph). It went on production one month later. In its first two production years, the chassis has been built by Carrier in Alençon and assembly took place at French coachbuilder Brissonneau et Lotz in Creil. The engine bay of the early model 530 was accessible by removing the acrylic glass rear window. French artist Sonia Delaunay painted a 530A at special request of Matra's CEO Jean-Luc Lagardère in 1968. 1969 saw many changes to the 530. First, the running gear followed the same evolution as the Ford model it was taken from and power increased to 75 DIN hp by using a different carburetor. Secondly, Matra closed a deal with Chrysler Europe, to sell their cars through the Simca dealer network from 1970 onwards and jointly develop the M530's successor. 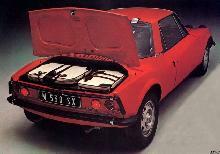 Finally, the cars were now constructed completely at the Matra Automobiles factory in Romorantin. 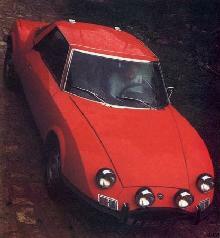 The British "Autocar" magazine tested a Matra M530A in March 1969. The car had a top speed of 95 mph (153 km/h) and accelerated from 0-60 mph (97 km/h) in 15.6 seconds. An "overall" fuel consumption of 26.9 miles per imperial gallon (10.5 L/100 km; 22.4 mpg-US) was recorded. This put it significantly behind the similarly priced Lotus Elan +2 on performance, but the two cars were closely matched on fuel economy. The Ford engined Matra's £2,160 manufacturer's recommended price was a little lower than the £2,244 price on the Lotus, but both were massively undercut by the £1,217 then being asked for the MG MGB GT, based on an older simpler design and sold in greater numbers. Also included in the price comparison was the Porsche 912 then being offered in the UK with a manufacturer's recommended retail price of £2,894 . The testers commended the Matra's refinement, handling and steering, soundness of construction and finish, while noting that its performance was 'not outstanding'. Introduced at the 1970 Geneva Motor Show was the Matra Simca M530LX, which was a minor redesign of the 530A by Michelotti. The most notable changes were the rear hatch (now made of glass and opens with struts like a hatchback) and the front bumper. A budget version of the 530, Matra Simca 530SX, was introduced in October 1971. The SX lacks the targa top roof and pop-up headlights. Instead there were four fixed headlights mounted on top of the front (hence it was nicknamed "The Pirate"), the only available colours being orange and white and the finishing was much simpler than the LX version (black instead of chrome bumpers). It wasn't commercialised on all markets where the LX was sold and while its luxury brother didn't sell well (because of its awkward "either you'll love it or you'll hate it" design, poor build quality and lack of engine power), the SX sold even worse. M530's production ceased in 1973, a total 9,609 cars (2,062 530A, 4,731 530LX and 1,146 530SX) have been built.